Many would not have seen it among the ceremony and pomp that has accompanied Prime Minister O’Neill’s historic visit to Bougainville – it was the big ‘for sale’ sign O’Neill and Momis have just dangled around the island. This is partly because O’Neill’s visit has been portrayed by a pliable media contingent as a historic act of reconciliation between PNG and Bougainville; the breaking of arrows. ‘Why here’, ‘why now’, are not words any one dares utter. But utter they should. For the past three years the ABG has made its development strategy clear – the sell-off of Bougainville’s marine, timber and mineral resources to foreign investors. As a result President Momis has been busy in the Philippines and China enjoying five star treatment, while Asian investors eye Bougainville’s riches, along with the old-hand Rio Tinto. When I need to raise the money for this mine, by going to banks and investors, wanting to raise billions of dollars, they’re going to say: “Tell me about Bougainville.” If Bougainville is the world’s newest nation, with no track record of managing projects, as opposed to PNG which has a long track record, it’s going to be easier to raise the money if Bougainville doesn’t go down the independence route. I wouldn’t even go to the market at this stage, because I can’t tell the market what they’re investing in. Enter Prime Minister O’Neill. With concerns being increasingly raised about Bougainville’s stability as it approaches its independence referendum, O’Neill and Momis have entered a pact of convenience. It needs to be said O’Neill is not hell bent on keeping Bougainville – he will respect the referendum decision – however, the PM certainly does not want an independent or autonomous Bougainville being a financial albatross around PNG’s neck for years to come. On the other hand, Momis has had something of an economic conversion since becoming President, and believes only a fire sale of Bougainville’s natural resources to foreign investors will save his land from ruin. Momis and O’Neill might not like each other (!! ), but they know they need each other. If PNG is to be rid of the financial albatross, O’Neill believes he must assure the international community that whatever the outcome of the referendum, PNG will act as a mature friend of Bougainville. On the other hand, Momis has bought the AusAid mantra and thinks that only the wide-scale sell off of Bougainville’s resources will establish an economic future for his island, so Momis needs O’Neill to act as a mature guarantor foreign investors can believe in. These are not necessarily well thought out or well supported strategies, indeed they may be the quickest route to wrack and ruin; but it explains the recent odd behaviour of Momis and O’Neill, who are what the kids call these days, ‘frenemies’. The prime minister of Papa New Guinea’s visit to the autonomous island of Bougainville this week – the first trip by a sitting PM since the end of the civil war in 1997 – has been warmly received by locals and ex-combatants. Heavy rain washed away bridges during the three-day trip, but using convoys of helicopters the Goodwill Visit reached Buka, Buin, Arawa and the controversial Panguna mine. The PNG delegation included minister for mining Byron Chan and minister for state enterprises Ben Micah. Thousands of people gathered at each event to hear the prime minister’s words of apology and reconciliation. “Along the way we lost focus, we made many mistakes,” Peter O’Neill said in the northern town of Buka. Across the island, ceremonies were heavy in symbolism. At one event the leaders of Bougainville and PNG both broke a bow and arrow across their knee to reaffirm the end of hostilities. “It is time that we stood together and accepted the responsibility to correct the wrongs as we perceive them,” Bougainville president John Momis said. “We must remember the purpose of the peace agreement otherwise there will always be a grave risk [that] violent conflict will begin again,” Mr Momis said. PNG and Bougainville fought a civil [the ABC refuses to acknowldge the war was against the Australian mining company Rio Tinto and the PNG govt was backed by the Australian govt] war in the 1990s, sparked by environmental damage and compensation claims flowing from the Australian-run Panguna mine. The war morphed into a struggle for independence and Bougainville became an autonomous region under a peace agreement in 2001. The most delicate part of Mr O’Neill’s three-day trip was a visit to the epicentre of the fighting, the Panguna Mine. The area is still a no-go zone, with a roadblock controlled by the hardline Merkamui faction. 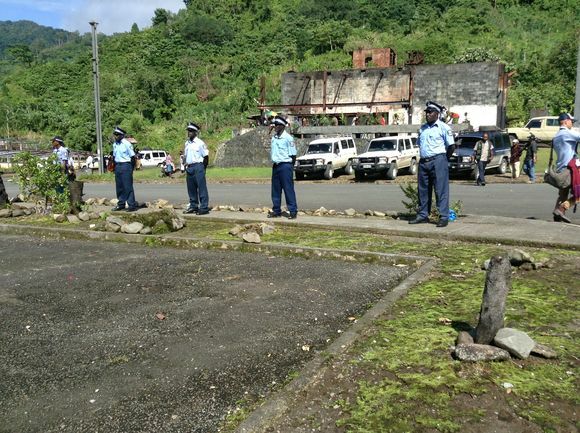 As the prime minister’s helicopter touched down at Panguna, ex-combatants worked with police to manage security and 20 Merkamui fighters stood by in uniform but unarmed. Hundreds of locals gathered to glimpse the leader of PNG, taking up vantage points amongst ruined buildings remaining from the conflict. “I’m happy, really happy because this is the first time he’s come since the crisis,” Lawrence, a Panguna man who was part of the welcoming cultural group, said. Mr O’Neill played down the significance of the giant gold and copper mine in the immediate future of Bougainville. “We are not interested in Panguna mine and some of the mining issues that are being discussed, ” Mr O’Neill said. Since the fighting stopped, little has been done to rebuild Bougainville. Mr O’Neill jokingly acknowledged the tendency of the main government district of Waigani to hold on to state money and promised to spend $2.4 billion on Bougainville’s development in the next five years. “This Government has already started the irrigation process of Waigani swamp,” Mr O’Neill said. He awarded a $1.45 million contract to a local firm to reseal roads in Buka and pledged to award more contracts for the Buka ring road and the Buka-Arawa road in February. The issuing of contracts to PNG and foreign companies is a sensitive issue among many Bougainvillians, with particular hostility towards Chinese businesspeople. At some point between 2015 and 2020 Bougainville will hold a referendum to decide whether to become an independent country or remain an autonomous region of PNG. However, an education program to explain the full implications of the referendum, autonomy and independence to Bougainvillians was only launched this week. The court order instructing the giant OK Tedi mining complex to stop dumping waste into Papua New Guinea’s Fly River system has still to be served. One of the lawyers acting for community leaders, Samson Jubi, says he’s being given the runaround. Meanwhile the government is pressing ahead with plans to appeal against the court’s decision. Prime Minister Peter O’Neill insists the issue of dumping is being addressed, that plans to build a tailings dam are in train, and he’s warning landowners that their actions could be counter productive with horrendous consequences. But for the Fly River people, Mr Jubi says the situation is already horrendous, and has been for decades. PRINCIPAL plaintiff Pr Steven Bagari has described Prime Minister Peter O’Neill’s response on the Ok Tedi court ruling as “totally false and misleading”. The National Court last Friday ruled in favour of the case by Bagari and six other plaintiffs and issued orders, among others, for Ok Tedi Mining Limited (OTML) to refrain from dumping mine waste and tailings into the Ok Tedi and Fly River system pending hearing of the substantive matter next month. “We have been fooled for 30 years and will not be fooled anymore and not by Peter O’Neill,” Bagari said in a statement yesterday. “I want to ask why has the prime minister expropriated all our assets and funds in the PNG Sustainable Development Program takeover and placed himself as the sole authority who decides who will receive compensation and by how much and when and where. “That is clearly the only effect of the Mining (Ok Tedi Tenth Supplemental) Act he introduced and passed in Parliament in September 2013. “If the prime minister was honestly attending to the environmental issues why is he allowing the Ok Tedi mine to continue discharging toxic mine waste and tailings into the Ok Tedi- Fly River system after 30 years? LEADERS of the Community Mine Continuation Agreement (CMCA) communities and mine villages in Ok Tedi are protesting against the National Court orders issued last Friday. “If it means that we will stay here a week waiting for them lawyers bringing the court order, this is our place and we will do anything to block this person from coming here. “Most of the women and children affected are in our area. THE people of Panguna have called on Peter O’Neill to start the process of repealing the Bougainville Copper Agreement Act 1967 immediately. Chairman of the Panguna Landowners Association, Law-rence Daveona, made the call in Panguna during the Prime Minister’s visit. “We appeal to you as the Prime Minister that you start the process of repealing this Act,” Mr Daveona said. “Our technical team stand prepared to assist with drafting any National Executive Council submission to get the process happening. “This is the best that the O’Neill-Dion Government can do for the people of Panguna and Bougainville. We want to know your thoughts on this. You, as our Prime Minister, can provide some hope and relief for us, as your former party leader, then Prime Minister Bill Skate, did for the people of Bougainville by brokering the peace agreement. Mr Daveona said the landowners were better organised then when the 1967 deal was signed between the then Rio Tinto or CRA, and the then colonial administrative government of PNG through the House of Assembly. “At present we are organised into nine associations; the SML which I represent, the Upper Tailings, Middle Tailings, Lower Tailings, Port Mine Access Road, Siokate Lease and the Uruawa Lease. This structured arrangement was never in place in the lead up to the signing of the 1967 Agreement,” Mr Daveona pointed out. He said landowners of Panguna mine and the surrounding leases were united for the re-opening of the mine. “But we wish to put forward certain conditions, one of the key ones being the repeal of the 1967 Act so that we can commence negotiations and discussions under a total new agreement,” he said. Mr O’Neill supported the call by Mr Daveona and the landowners saying that the 1967 Act will be repealed and a new one put in place. He also emphasised that the process of restoration to provide government services to Panguna has started and will continue. He said he was very happy for the landowners and Me’ekamui’s desire and commitment to work with the ABG and the national Government for the betterment and progress of Bougainville. 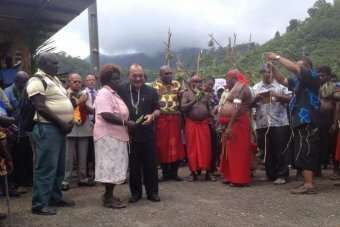 PRIME Minister Peter O’Neill officially announced to the people of Bougainville that his visit to the region is not to talk about the re-opening of Panguna mine or politics. “I am not here either to talk about Bougainville Peace Agreement or to talk about re-structuring of the autonomy government. All these things are already in place and fixed by our past leaders and there is no time for the Government to talk about them,” Prime Minister O’Neill told the people of Panguna yesterday. Mr O’Neill said for too long our people have suffered in Bougainville, especially when the governments and leaders of Bougainville did not work together. He outlined that many parts of Papua New Guinea were changing while Bougainville was still lagging behind in terms of infrastructural developments. “The Government has a responsibility to make sure the Bougainville Peace Agreement and the autonomy power we give to Bougainville must work and progress well,” he said. “The Peace Agreement has many outstanding challenges which we all need to take ownership of and work together to address. ABG alone cannot do it or Me’ekamui alone cannot do it. “ABG and the Government are working in partnership to maintain and sort out the restoration of Bougainville. “The PNG Government has chipped in more than K500 million to do restoration work on Bougainville, K200 million is already parked in the trust account and we must start to rollout projects such as the road sealing from Kokopau to Buin. “Also there is an outstanding issue on the K15 million grants for ABG government that will be sorted. “I’m calling on the ABG and all the leaders of Bougainville to work together and put away your differences and speak in one voice for the good of the people and progress of the region. “We must be man enough to sit down and iron out our differences. I am appealing to the leadership of Me’ekamui and the leadership of ABG to work together for the benefit of the people of Bougainville because the national Government is ready to work with you. “Like I mentioned earlier, the issue and green light to re-open the Panguna Mine is in the hands of the landowners, the ABG and the Me’ekamui government. There is no government in this country who will force the opening of any mine or establishment of any projects without the consent of the landowners first. “Negotiation to start off the mine is in your capable hands, like I said earlier, I am not interested to kick-start the re-opening of the mine. If the landowners give the green light, then we can find some way forward into the issue. “My interest is to bring government services into Bougainville. I know a referendum will come, my interest is to open Aropa Airport, Arawa Hospital, seal the Kokopau to Buin Highway and all feeder roads in Bougainville.